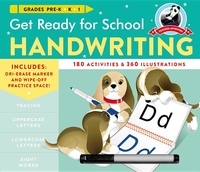 Get ready for kindergarten, first grade or any grade with Get Ready for School Handwriting, the essential take-along workbook featuring a dri-erase pen and wipe-away practice board that provides hours of fun, skill-building activities that will help children write more clearly, easily and with pleasure. Children love to write their names, and this proud achievement can lead to creativity-building writing. That's why Get Ready for School Handwriting is ideal for children from pre-kindergarten through first grade; it can joyfully instill better letter formation, teach lower case and upper case, and support other essential writing skills. These 128 reproducible pages feature tracing with directional arrows and starter dots for letters, as well as numbers and number words, days of the week, and months of the year. Young writers will also encounter new sight words, learn to combine letters to make words, and grasp essential sentence structure concepts through colorful fill-in-the-blank activities. Here's a perfect one-the-go entertainment that will help prevent brain drain.